2014 Recap: Fantasy Life and the Pleasure of Doing It "Wrong"
There's a thin line between mediocre and misunderstood, and sometimes the difference simply comes down to personal tastes. 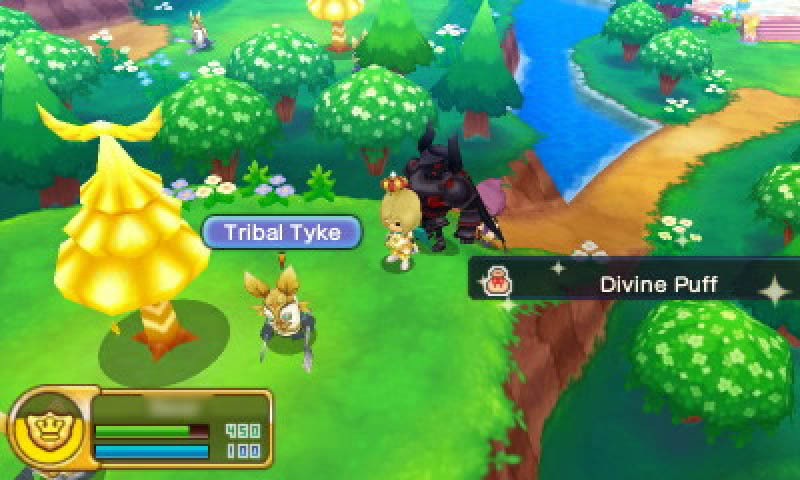 I loved Fantasy Life, Level-5's genre-straining RPG/MMO/life sim/adventure for 3DS. Based on pretty much every other review I've read of the game, that makes me some kind of bizarre idiot with terrible taste and no idea what a good game even is. Let's pretend for a moment, though, that this is not the case (though you haters in the audience can go ahead and sneer about how you knew it all along), and that I actually do have consistent and defensible taste in games. If that's true, how could my boundless affection for Fantasy Life possibly exist when nearly every other person to review the game complained about its aimlessness, its excessive chattiness, its repetition, and its general lack of urgency or purpose? The simple answer amounts, basically, to the old maxim: "To each their own." Which is all well and good, but that speaks to me, to my tastes. But even if there's no such thing as an objective review, shouldn't a review ultimately have to do with the qualities and traits inherent to a game? Generally, yes, though it depends on the vintage of the games journalism in question (newer vintages tend to be less about the game and more about the person whose experience and tastes serve as a lens for the subject matter). Still, I feel like I managed to give Fantasy Life a positive review on its own terms rather than because it reminded me of some obscure personal memory that has nothing to do with anyone reading the review. The reality of the situation is that Fantasy Life, I think, falls under the category of games that simply tend not to review well. Not that they're bad or so transcendent mere mortals can't appreciate them, but rather, the elements that make up the game don't mesh well with the reviewing process. On a deadline, trying to dash through an assignment as quickly as possible, the last thing a reviewer wants to deal with is a game that has the audacity to take its sweet time. The review experience, especially in the autumn when releases come fast and frequent, tends to be an awful lot like the wedding scene from The Princess Bride. The reviewer, of course, is Prince Humperdinck, and the goal is to get married (publish the review) before the Dread Pirate Roberts (the next game to review) arrives at the castle (website). Fantasy Life, unfortunately, comes off an awful lot like the senile old priest, comically meandering its way through a lot of ceremony that the reviewer just wants to get over and done with. "Man and wife!" hisses the reviewer, critical pathing through the plot and posting a terse (and visibly irritated) review the instant the embargo lifts. Fantasy Life does not lend itself to being explored on the critical path. You can play it that way, rolling a warrior-type class and doggedly advancing from plot point to plot point. Under that tactic, it would be a pretty short game. Frankly, though, I can't imagine a more insipid way to play Fantasy Life; the main plot is no great shakes, and it's actually fairly low on action while being heavy on lengthy, wandering conversations crammed with Japanese-style verbal reiterations and dad-style lame jokes. To rush through Fantasy Life is to subject yourself to a tremendously boring and toothless RPG jam-packed with dumb conversations. Fantasy Life really wants you to play it like you would an MMO — I've seen a lot of comparisons to the class system in Final Fantasy XIV — and the interlocking skill mechanics that stretch across its various "lives" possess the same general addictiveness as Dragon Quest IX or Skyrim. What do Final Fantasy XIV, Dragon Quest IX, and Skyrim have in common? They all reviewed a lot better than Fantasy Life, that's for sure. In fairness, that's because they're better games than Fantasy Life — it lacks that last little bit of something that would push it into their tier. But still, that doesn't quite account for the disparity in the their comparative score, for the 15-to-25-point discrepancy between Fantasy Life's Metacritic score and those other games'. Fantasy Life's failing, I think, is mainly one of presentation. It doesn't put itself forward as an immersive epic like Skyrim; it lacks the scope and immensity of Dragon Quest IX; and its multiplayer components seem meager compared to those of FFXIV's. Maybe it's a matter of Nintendo's marketing and the choice of platform, but at first glance it looks to be a sort of small-scale life sim along the lines of Animal Crossing or Tomodachi Life. It quickly reveals itself, however, to be much more of a traditional action-RPG... except that those life sim elements really are a part of the design, whether you like them or not. The game ends up sitting at an odd crossroads between genres, refusing to commit wholly to either, dabbling instead in both. 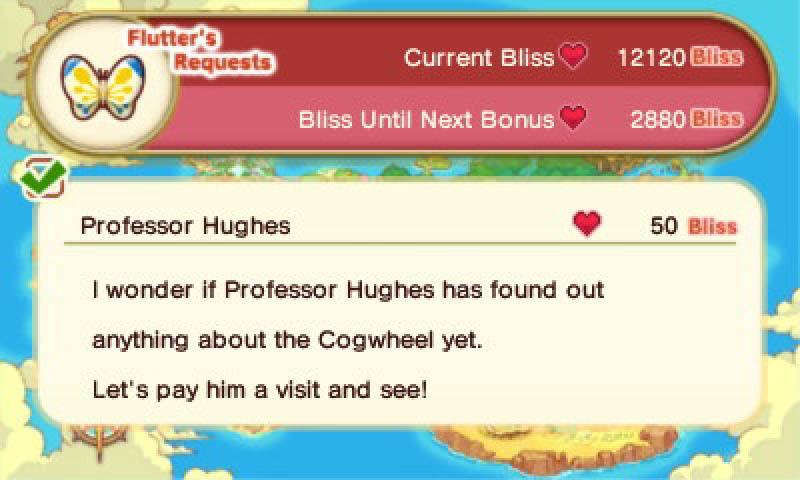 As such, the optimal way to play Fantasy Life is to take it slowly. Not to rush to see the ending, but rather to take it a bit at a time, alternating between life-related objectives and big, story-advancing quests. Parcel out the combat, the gathering, and the jabbering NPC conversations nice and evenly, so you're never doing too much of the same thing at once. Because there is a lot of repetition inherent to this game; each facet of the game tends to involve performing many of the same tasks over and over again. This is most evident in the crafting systems, all of which use the exact same minigame setup — a baffling design choice that makes the overall adventure feel far grindier than it ought. When you find a comfortable flow, though, Fantasy Life has the same Skinner box addictiveness of the best RPGs, with systems flowing into and feeding one another. Most of the classes involve skills that interlace with objectives or abilities from other classes: A Blacksmith alone can't accomplish much without spending enormous sums on materiel to forge, but spend some time as a Miner and suddenly you have access to huge (and free) piles of ore to refine. Of course, a Miner needs a good pickaxe, and spending time as a Woodcutter can provide access to superior wood for that end well ahead of the normal game flow. I suppose what I enjoy most about Fantasy Life is the way it defies "proper" game design thinking. It conspicuously fails to recreate the efficiency that contemporary games seemingly value above all else: The sensation that you're not so much playing as hurtling down a greased chute toward the credit roll. It walks a careful line between the structured get-to-the-end design of single-player titles and the endless, aimless, no-win churn of free-to-play or multiplayer experiences. It embraces both philosophies of game design, and in doing so gently rejects them as well. It creates a time-sink treadmill of interlocking objectives and repetition, yet it does so within the context of a finite tale, allowing you to step off that treadmill and make meaningful progress at nearly any time. And, more importantly, it creates value for those mundane tasks. When I look at the games I enjoyed most this year, a good many of them deliberately turned their backs on the rules of big-budget, mainstream, "proper" game design. Alien Isolation dabbled in stealth, horror, and raw shooting, always leaving players a little on edge with its refusal to settle down and be one thing or the other. Wolfenstein laughed at the rules of modern FPS design, willfully existing in a finite, single-player space. Captain Toad: Treasure Tracker invested AAA polish into a compact little puzzle game. Lightning Returns gave players an open world and then put a hard time limit on the whole thing. Bravely Default dared you to experience its bizarre, Groundhog Day-like latter chapters on the game's own terms rather than simply skipping ahead. All of these choices go against the grain of what games are "supposed" to do in order to be popular and succeed, and I loved them for it. 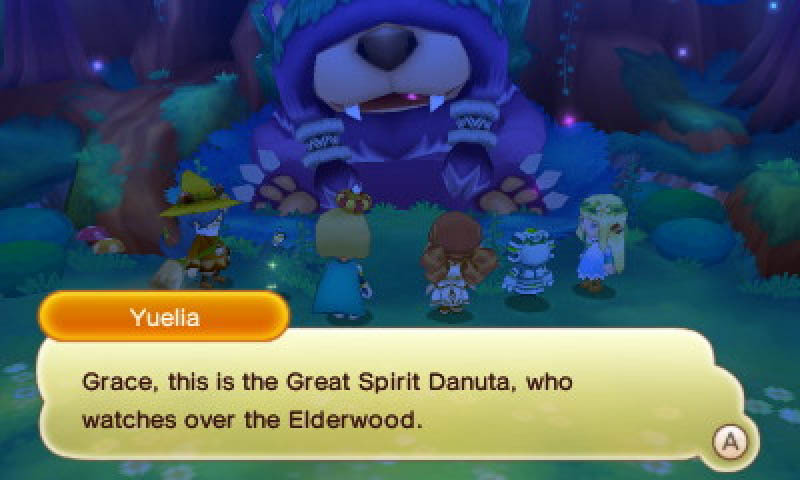 But Fantasy Life, in its low-key, dad-joke way, might be the most defiant of them all. As Nich Maragos recently pointed out over at The GIA, Level-5 put considerable thought into the workings of Fantasy Life's design, consideration that you have to look hard to discover. He was able to complete the game with a pacifist run, refusing to kill a single living creature. And while this approach left certain high-level objectives tantalizingly outside his grasp — tough to master the Hunter or Mercenary classes without killing anything, after all — he also took note of countless tiny design choices where the creators deliberately put a goal or a resource within the reach of a pacifistic player. We — and by "we" I mean both game enthusiasts in general and game reviewers in particular — have an unfortunate tendency to demand more creativity in our games while simultaneously punishing games for taking risks or avoiding comfortable design conventions. I'm certainly guilty of this myself. I'm trying to be better about this, though; whether it means accepting that a stripped-down dungeon-crawler won't regale me with a convoluted narrative amidst its arduous combat or recognizing that some games just aren't designed for people like me, I'm determined to better appreciate games for what they are and what they aspire to be, rather than for how well they fit into some little box. It's games like Fantasy Life, that ramblingly do their own thing, that offer this medium its brightest hope of survival amidst rising development costs and a broken global economy that leaves the young underemployed and forces them to be as parsimonious as possible. Games like Fantasy Life, not buggy blockbusters whose publishers have clearly paid more attention to creating hooks for paid DLC than to making sure the product that hits shelves actually works like it's supposed to. Besides, we all need more dad jokes in our lives. Tagged with 2014 recap,	Column,	Fantasy Life,	Level-5,	Nintendo.